During Saturday's Showtime broadcast of Lara vs. Hurd, Mayweather stated that he's considering one more fight and that it would only be in the UFC. "It is possible I do come back, but if I do come back, it has to be in the Octagon", Mayweather told Showtime. "And just to clear something up", White said, "and I don't want to give this guy any publicity because he loves it, but that greasy, slimy, rat Espinoza talking about how, "Oh, we break the rules" and all this other (expletive). I'm Floyd Mayweather", hinting something may be in the works. "Outside the ring you have to carry yourself as a gentleman", Mayweather said when asked about the bus incident. "We're going to make that fight". Mayweather added people should know he is not serious when he says this will be his last time in the ring. Yes, but if I do come back it has to be in the Octagon. 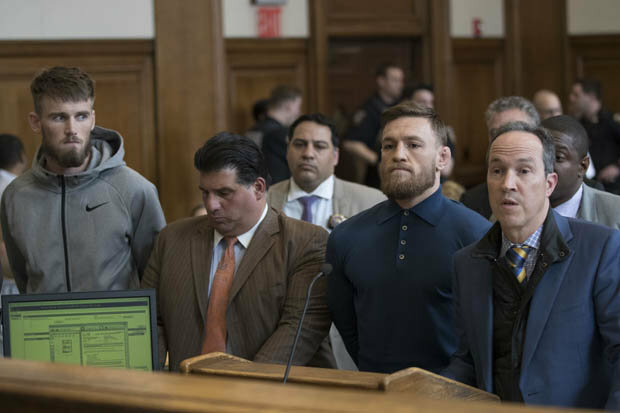 McGregor was bailed in NY on Friday after being charged with assault and criminal mischief by the NYPD over the attack on a bus at a UFC press conference a day earlier. After Mayweather stopped McGregor in the 10th round, the Irishman will be desperate for revenge, and in his known fighting environment, he will definitely fancy himself to end Mayweather's unbeaten reign and take the bragging rights back to Ireland. Boxing appears to be dead and over for Mayweather as an active fighter. He was released from custody on bail of $50,000 with a court hearing set for June 14. One thing Mayweather said was certain was that he is done boxing. If Mayweather goes into an MMA fight, he said it would be at 145 pounds. Obviously, McGregor seems the most likely opponent, but with his most recent run-in with the law, it isn't clear if he will return to the UFC - or if he will be welcomed back.